PK is a full-thickness transplant procedure, in which a trephine of an appropriate diameter is used to make a full-thickness resection of the patient's cornea, followed by placement of a full-thickness donor corneal graft. Interrupted and/or running sutures are placed in radial fashion at equal tension to minimize post-operative astigmatism (Figure 2). 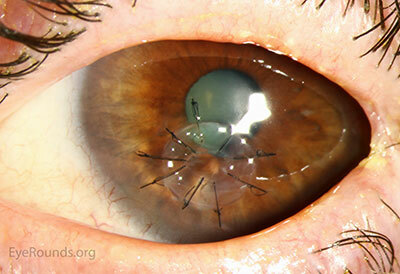 Later, the sutures are removed selectively to reduce the amount of astigmatism present. A transplant can last decades with proper care (Figure 3). While once the most prominent type of corneal transplant, PK has been supplanted by partial thickness techniques for endothelial dysfunction without significant stromal scarring. 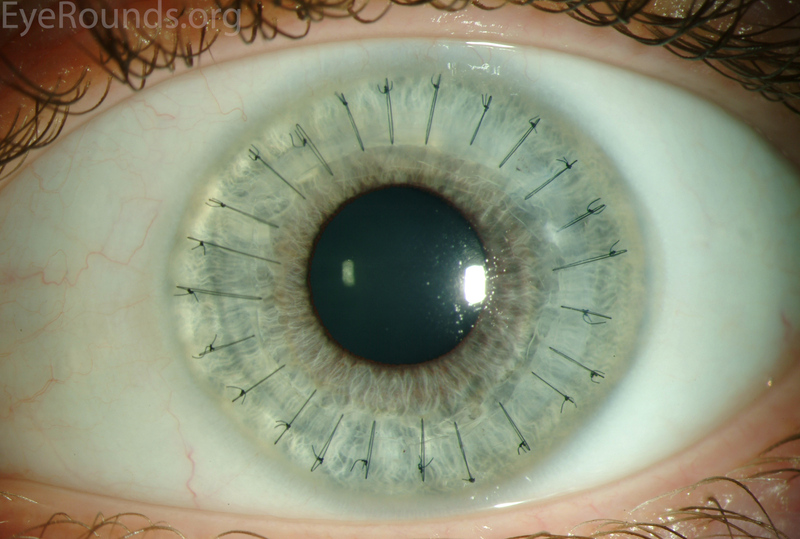 PKs are performed primarily for visually significant stromal scarring, opacities with an uncertain status of the endothelium or significant posterior corneal involvement, corneal ectasia (such as keratoconus and pellucid marginal degeneration, especially if there is history of hydrops), combined stromal and epithelial disease (such as Peters anomaly), and infectious or non-infectious corneal ulcerations or perforations (1, 14). 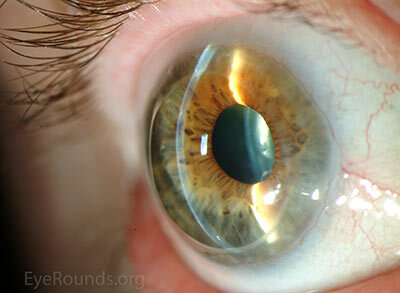 A variant of the procedure, the mini-PK, can be used to treat more focal defects in the cornea (Figure 4). Figure 2: PK grafts with 16 (A) and 24 (B) interrupted sutures. Grafts can also be secured with a running suture (C) or a combination of running and interrupted sutures (D). Figure 3: A PK graft, with all sutures removed, remains crystal clear 30 years after the procedure. 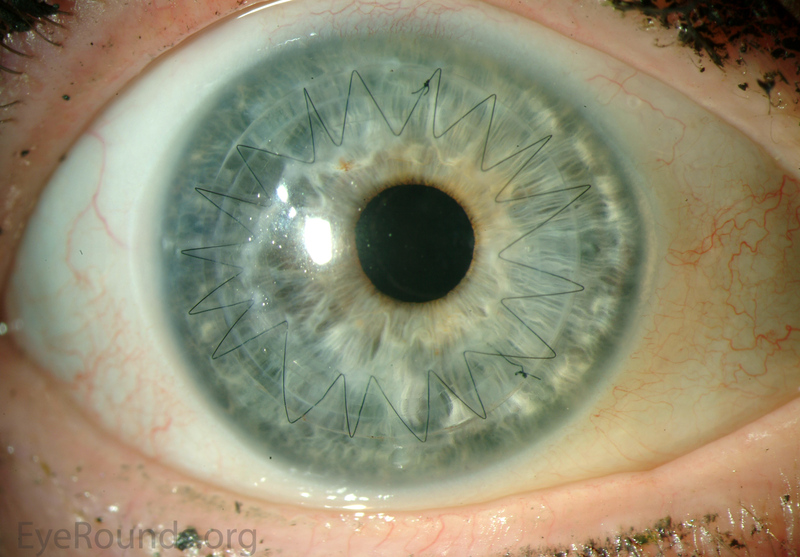 Figure 4: A mini-PK graft performed for a focal corneal perforation. PK grants the ability to treat disease in the epithelial, stromal, and endothelial layers. 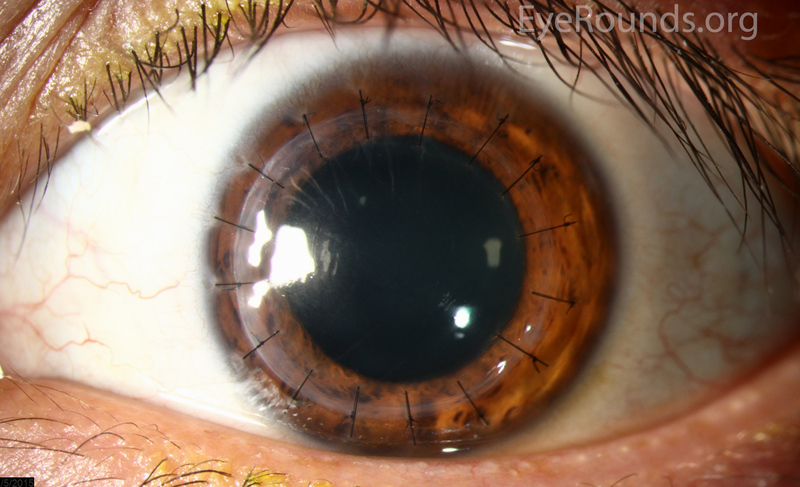 A full-thickness graft also eliminates optical interface related visual problems that may exist with lamellar transplants with a stroma-stroma interface. However, postoperative recovery time is relatively long, sometimes taking years to achieve best-corrected visual acuity. 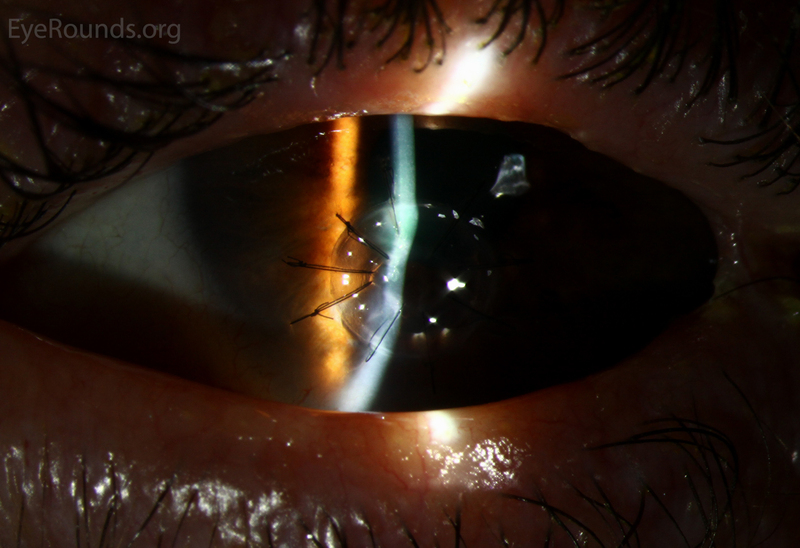 Frequently, there is substantial postoperative refractive error due to high regular or irregular astigmatism of the graft, and a higher chance of requiring rigid gas permeable contact lens wear to correct astigmatic error. There is a higher risk of allograft rejection compared with other keratoplasty types. Additionally, PKs carry a higher lifetime risk of wound dehiscence due to the compromised tectonic strength that comes from a full-thickness wound. 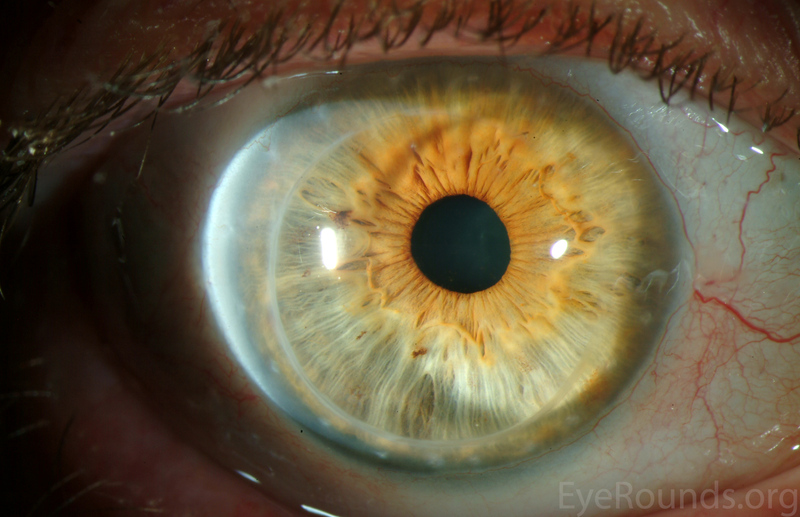 Mark the center of the host cornea with a Sinskey hook. Use calipers to measure the corneal diameter to determine the appropriate size for donor trephine. Trephinate the donor tissue, typically aiming for 0.25 or 0.5 mm larger than the planned host trephination. Trephinate the host cornea to approximately 90% depth. Create a paracentesis in the trephination groove or the corneal periphery, and inject Healon into the anterior chamber to preserve anterior chamber depth and stability. After using a blade to enter the eye through the trephination groove, resect the host cornea tissue using curved corneal scissors.